You can only take so many pictures of the Tricolored Heron before you are reduced to taking pictures of people taking pictures of the Tricolored. 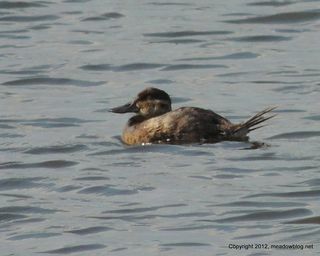 It was seen about 4:15 p.m. on Thursday where the Transco Trail meets the Marsh Discovery Trail. The bird has been here two weeks now. We saw one of the Least Bitterns along Bittern Cove at the other end of the Marsh Discovery Trail (near the guardhouse) around 2:30 p.m. Friday, and others have been seen as well. 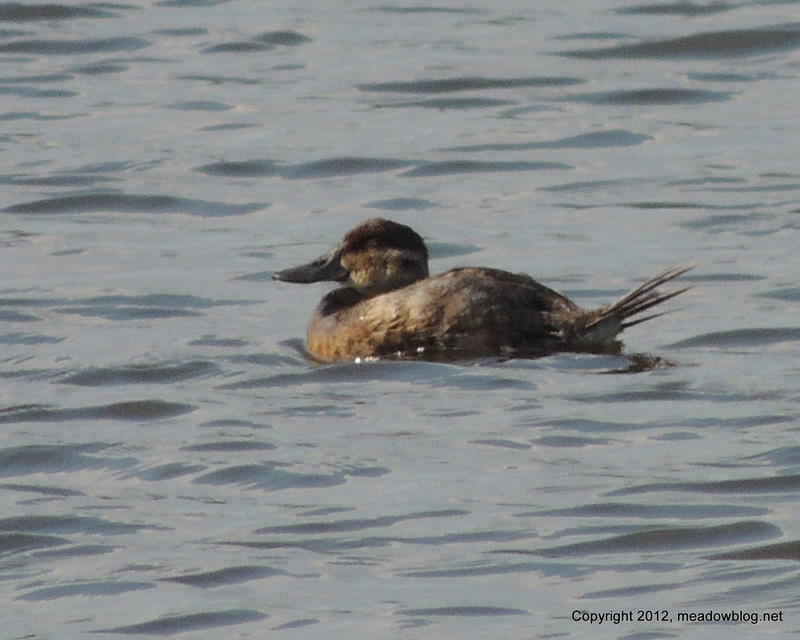 Had a Ruddy Duck in the Shorebird Pool on a few occasions recently. 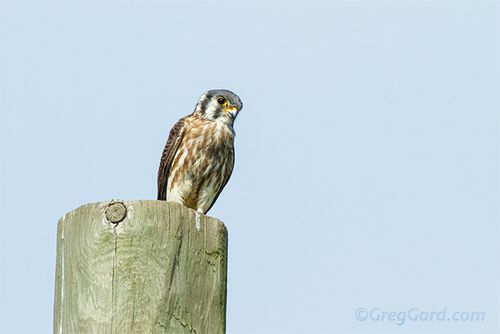 Greg Gard did a great video of one of the many American Kestrels hanging out near Disposal Road. Psoting it Monday because we don't want to have too many American Kestrel posts in one day, do we? Late last month, we had two reports of a wing-tagged American Kestrel in the DeKorte Park/Disposal Road area. Rosemarie Widmer saw a wing-tagged kestrel with a No. 9, but lacked a camera. 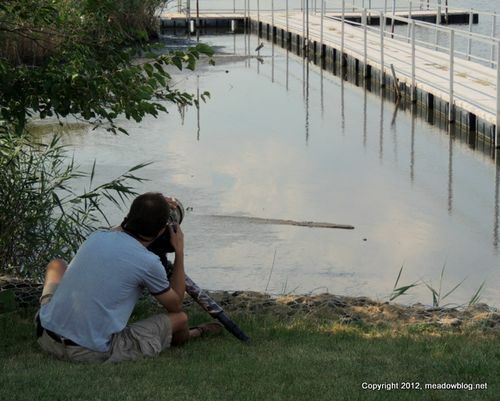 And about that same time, Doug Tilly had a camera but couldn't see the number on the wing-tagged American Kestrel. Doug wrote: "Came across 6 Kestrels in hunting and hanging out on the dump along Disposal Road at noon today. I could see all 6 at once but not in the camera lens. One of them had an orange tag on its wing." Through the wonders of communications, we put two and two together and located the tagger — John Smallwood of Montclair State University, who reports banding two female American Kestrels with #9, one on the left wing and the other on the right wing, in June in Sussex County. "Here are a couple of photographs taken on Disposal Road Wednesday morning. 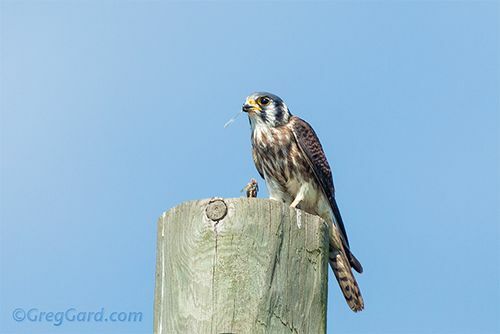 "I found there a cooperative American Kestrel who didn't mind my presence and was actively hunting and consuming his food near me. "At one point a Red-tailed Hawk flew to close to "Kestrel's" territory and all of a sudden he was surrounded by 5 American Kestrels. They flew in circles for about 2 minutes attacking the Red-tailed Hawk. 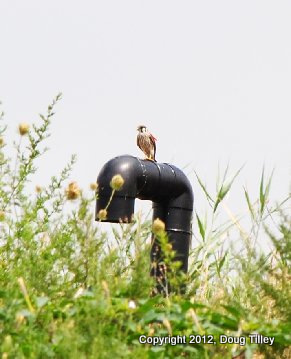 "Later on, I saw Kestrels perched along the Disposal Road on either black pipes or trees. One of the Kestrels had an orange tag #9 on his wing." 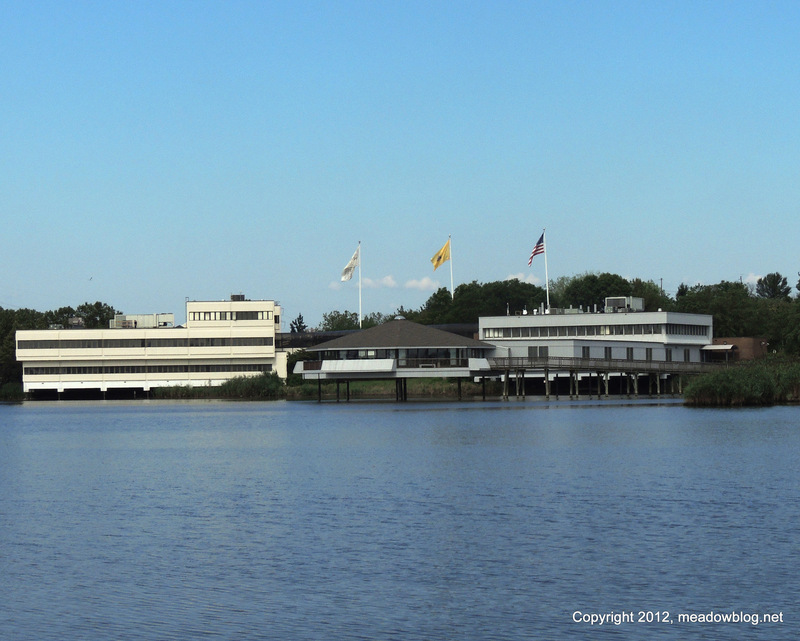 Our Latest South Bergenite Column: DeKorte Rules! Jim Wright, who keeps this blog, also writes a twice-monthly column for The South Bergenite. Here's his latest. ﻿If you love beautiful birds and butterflies, now is the time to visit DeKorte Park in Lyndhurst. The one-square-mile park is a jewel just about any time of year, but late August is particularly awesome. The fall shorebird migration is in full swing, and when the tide is out, the mudflats at DeKorte Park are filled with thousands of shorebirds feeding on the little critters that live in the mud. These long-distance fliers need to chow down and bulk up for the rest of their trip — all the way to South America in some instances. Reserve Your Seat Now For a Special Major Screening! 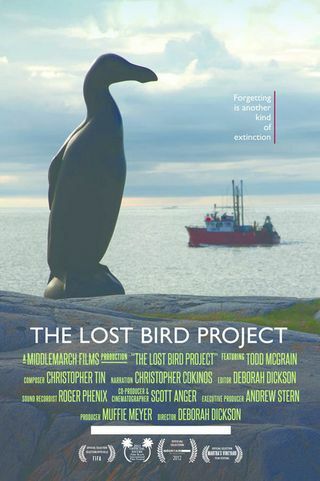 Here's your chance to attend a free September screening of the acclaimed new documentary film, "The Lost Bird Project,"about the stories of five birds driven to extinction in modern times and sculptor Todd McGrain’s project to memorialize them. The event is on Thursday, Sept. 13, from 7 to 9 p.m. in the Meadowlands Environment Center in DeKorte Park, Lyndhurst, New Jersey.